Trumple, the little duck is in big trouble. Without any memories she woke up inside a great arena. From behind a dark gate the scary noises of huge creatures reach her ears. What, when the gate opens..
Not able to fly, she has to run. As longer she survives, the more points you'll get. There is a highscore list where you can enter your nickname and your land to show others your score. You can list the highscores from today or from all time, wordwide, only for your country or for any country in the world! 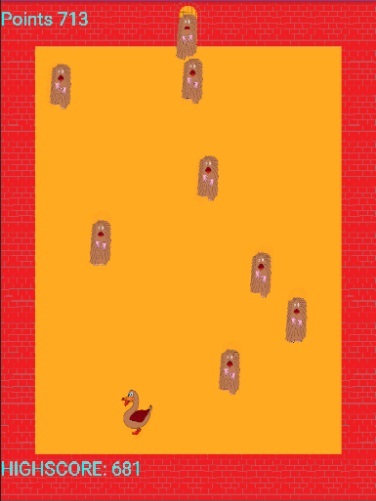 Very simple game with a duck, four walls, a gate and evil monsters. This game is freeware! No in-app-products and no advertises while gameplay. Advertises are shown only after the highscore list. Please click, if you like the game.